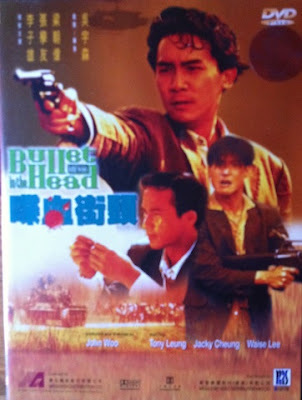 Bullet in the head is my favourite of all John Woo's films, it gets inside my head everytime I see it and without fail pushes all the little drops of salty water from my eyes. Since it's my pick of Woo's movies I had to have a poster for it but didn't like any of the designs produced for it, until that is I came across this little beauty. It's a little beat up but this thai poster is absolutely beautiful, it's easily one of the best posters I have and I wouldn't part with it for anything. You can still find them on ebay if you're interested. Over the years I've had more versions of this movie than just about any other, actually that's not true, that dubious honour probably belongs to either The Killer or Hard boiled but Bullet must be next in line. I had various bootleg VHS tapes, including one purchased from Eastern heroes head honcho Rick Baker at the Scala cinema in London. That tape had a xeroxed colour cover, pretty decent picture and sound quality but the tape ran out five minutes before the end of the film! I think the next version was the Hong Kong laserdisc which was obviously a huge improvement except that it was cut to make the film fit on one laserdisc. Next up was the UK Made in Hong Kong VHS (which I still have somewhere but couldn't find for this post) This was more like it, at the time the most complete version available. At the dawn of the digital age, I picked up the vcd on my first trip to Hong Kong as it was rumoured to have a completely different ending to any version seen before, "The boardroom ending" as it's known. I will save my thoughts on the two endings until I cover the film in depth, I do consider the vcd very worthwhile though. 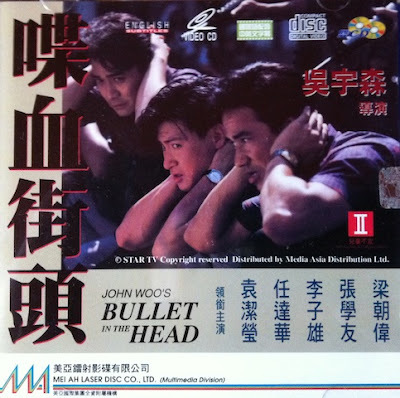 Shortly after this Megastar issued the first dvd release of the film and typically of early HK dvd releases it was a pretty poor effort, although to their credit it was at least a dual layer dvd. The credit didn't go very far though due to a terrible 5.1 remix of the audio, with no other audio option. Things got better when Fortune Star remastered the title and it was released by both Hong Kong legends in the UK and IVL in HK. The Hong Kong legends dvd was one of their Platinum collection titles meaning a second dvd of extras, in fact the cover promotes five hours of bonus material, the Bey Logan audio commentary is an excellent listen. The image quality in particular for these releases were a significant jump forward from previous versions. The Hong Kong legends dvd has the best subtitle translation of any version to date. Not too long after IVL released the remastered dvd, Joy Sales announced a new Ultimate edition, which would insert deleted scenes including the legendary piss drinking scene from the festival print, only ever available on bootleg VHS. The "seamless branching" used to insert the scenes is far from seamless, but it is good to have them included and the general quality of the dvd is pretty good. Some prefer the image quality to the HKL disc, but for me the image is too bright and the red colour balance is off, leaving skin tones looking very pinkish. A very good example of why screen grabs should not be used alone to judge video quality, as in comparison shots the Joy Sales looks better but when viewed in motion the HKL dvd is my much preferred option. The Joy Sales subtitle translation is poor, considering the film was re-translated, the usual grammar issues surface, the subtitles that appear for English dialogue are almost always wrong and most unforgivably one of the most important scenes in the film is ruined. A second disc of extras is included but these pale in comparison to the riches of the HKL release. 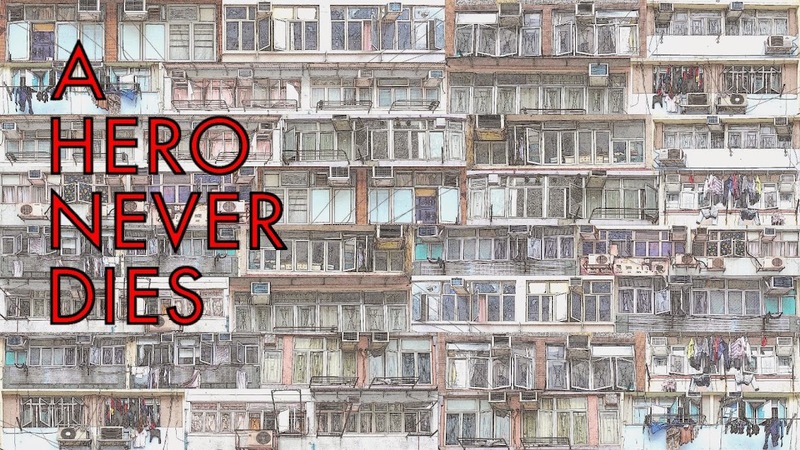 Which brings us up to date with the release of the HK blu ray from Kam and Ronson, I will be watching this over the weekend and posting a full piece on the film and disc soon after, I'm really excited about this, so look out for it. Yeah, I wrote a pretty epic review of this for KFCCinema (RIP) just after the Joy Sales edition came out. I think this was the third edition I'd bought, following the MIHK VHS and the Megastar DVD. I gave their DVD a pretty harsh roasting, although it always irks me the I forgot to mention the fact that when you stick the DVD in a PC, it has the title 'All About Ah Long', which perfectly illustrates their approach to quality control. Fascinating stuff M, I always enjoy reading about different versions of films - I'm a card-carrying Video Watchdog reader so this stuff always interests me. Looking forward to your review - I personally find favourite films the hardest to write about ! Good overview! 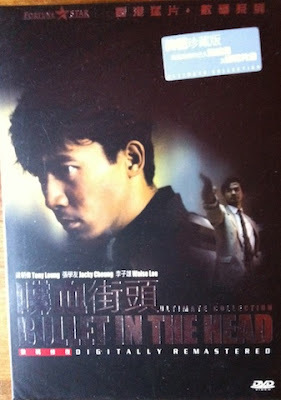 Honestly, with such a troubled production and reception (in Hong Kong anyway) and the multiple DVD releases, I think the fact there is no officially very strong disc or VHS of this film released has made this film fall out of favor in comparison to Woo's other classics. I think this is one of the best 90s hong kong films so it's a huge shame. Stelar movie to cover, AHND. Looking forward to a more in depth review. It's a heady production from Woo and the film of his that possible resonates the most. 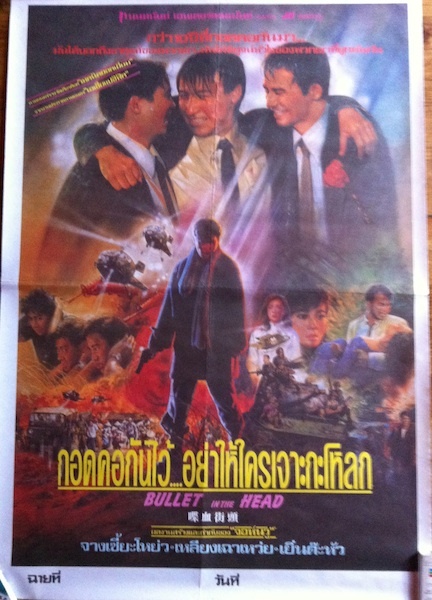 Great Thai poster too! I have a few Thai posters and the art work is just astounding! I have my eye on a bunch more from Ebay. I just love them. So how many versions are there exactly? And which "version" is the one Woo intended? Or is it that he could'nt make up his mind and just filmed a whole bunch of versions with different endings? Or more likely to film different versions to cater to different markets? (i.e. 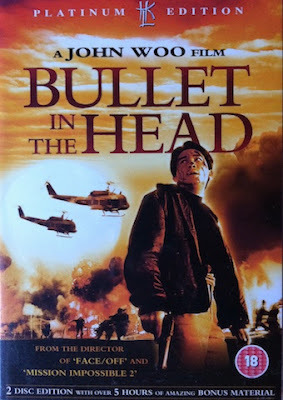 Bullet in the Head-Thailand version, Malaysia version, US version, UK version, Somalia version, Martian version)Ok, maybe not the last one, but you get the idea. Dan, great review. I've never put the DVD in my pc, that's just shoddy. The HKL is way better, it's better in just about everyway. Working on the review! Wes, me too where Video Watchdog is concerned, it's a great read and has turned me on to a great many films I may not have discovered otherwise. I agree, favourites are always the hardest to write about, if only because it's hard to know where to stop! A. I always hoped for a Criterion release for it, after they did The Killer and Hard boiled it seemed a possibility but no. The HKL is comfortably the best release available. I think the movie is too hard going for western audiences who lapped up Woo's other HK movies, so I don't think it will ever get the recognition it truly deserves. Kingwho? Those Thai posters can be amazing, some not so much but when they're on they're really on! Which ones do you have? Have you posted about them or do you have plans to? I've got my eye on a My heart is that eternal rose one. Anon, Many versions exist because the film didn't perform at the box office. Woo's original version was around 3 hours but had to be edited to be more cinema friendly. The cut footage was apparently thrown away, so we will never see it as it was meant to be unfortunately. The festival print had some footage either left in or reinserted to the theatrical version but has never been officially released, the nearest is the bastardised Joy Sales DVD. I guess Woo filmed the alternate ending to see what worked best, he has stated that the car shootout is his preferred version. More in the review soon!